Cast photos for The South Florida Symphony Orchestra's new adaptation of "Porgy and Bess." The set design to The South Florida Symphony Orchestra's, "Porgy and Bess." The South Florida Symphony Orchestra's Maestra Sebrina Alfonso is bringing the groundbreaking George Gershwin 1930s opera “Porgy and Bess” to the region for a series of performances. The opera follows the story of poor African Americans struggling to survive and make money in the fictional neighborhood of Catfish Row in South Carolina. The opera was significant for shining the spotlight on black art in America by featuring an all-black cast. Alfonso is a 6th generation “Conch” and started the orchestra in Key West 21 years ago. She calls the opera, “probably the most incredible score Gershwin’s written.” She joined Sundial to talk about the production and the challenges she's faced as a female conductor in a male dominated industry. Listen to our interview with the conductor of The South Florida Symphony Orchestra, Maestra Sebrina Alfonso. WLRN: Tell us a little bit about this production. ALFONSO: Porgy and Bess was actually written about a specific place in South Carolina, Catfish Row, and about Porgy, who was a real character that lived in this community. It's really about their life on Catfish Row and their joys. Their ups and downs. But the reality of the hard work that these people had to do to make ends meet. Yet, they came home in the evening and they expressed their joy of life, of each other, and their love with dance and song. The most incredible experience is the music and songs of Gershwin. This is probably the most incredible score Gershwin’s written and you know he died at 38. This man has put out so much music and he died at such a young age. And I'm curious how this opera is representative of race relations in America? For sure it shows the way the African-American community was treated in the 1930s and quite frankly in a kind of a different way but in the same way you know the treatment that they get within law enforcement, right? Something interesting too is how much this has changed over the years. In some of the original score there were racial slurs. You can't use that today. No, and actually the score was rewritten by Gershwin himself. He took them out. In my score ... it doesn't have any of that. How did you adapt this the way you wanted it? What's the show you want to give people? Well for me just because I've had the opportunity to sit and speak with the characters...they love these characters. They sit and tell you a story. So for me the story really is about the life of these incredible people. 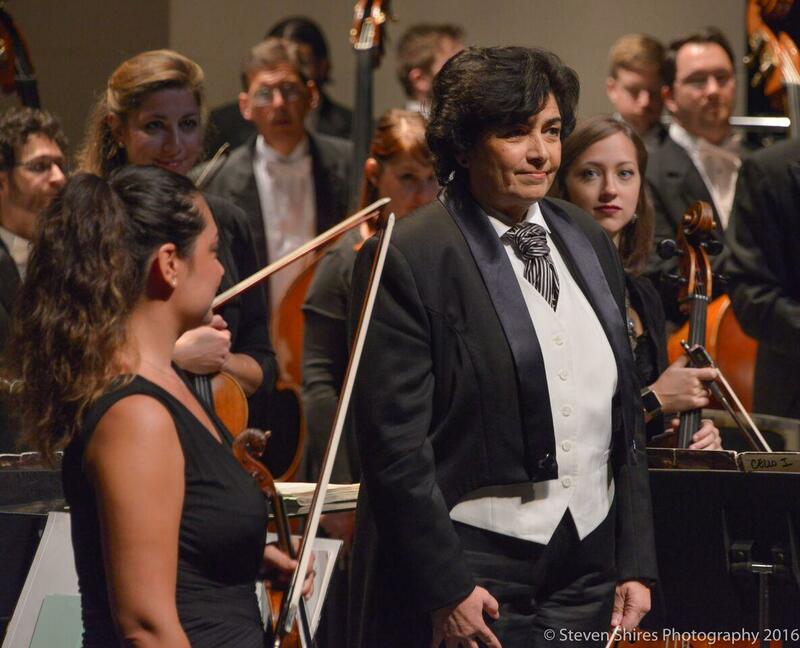 Maestra Sebrina Alfonso leads The South Florida Symphony Orchestra. I wanted to ask you about your story, your history. It's fascinating how you got started with the orchestra. Why did you initially want to start the group? I'm from Key West and quite honestly I knew from seventh grade that I wanted to be a conductor. I think my family and I always knew I'd be in music but not sure what that path would be. But seventh grade I decided I'm going to be a conductor. And when I had the opportunity to live in Italy in the 9th grade for about a year-and-a-half, I stumbled into this opera house in the middle of the day. I went into the venue because it was towards the end of the performance there's this singer on the stage dying and I see this muff rolling down the stage and the whole audience is crying. And I just looked around and I realized right then and there that there were many more things that I could explore as a conductor and sort of put me on the path. Female conductors are the kind of rare in the classical music world. How were you able to breakthrough and achieve that leadership status in the industry? What was it like? It's exactly what you say and I do think it's getting better. I do see the younger females are starting to work their way up. There's still a huge glass ceiling to break but you know there's a couple that have broken through. You have the younger generation of musicians that are starting to take their place in the orchestras and their mindset isn't necessarily that a conductor has to be male. So I think in the next 10 to 20 years it's going to be a major change. You can check out the full listing of shows and dates here.